Watch video and interview here. An operator high atop a pneumatic asphalt paver was assisted by two "back men" (otherwise called a screed or back end operators) at the rear of the machine on a little platform slightly above street level and by a crew of about 10 holding rakes, "lutes"and shovels laying down new street "mat" in northwest Philadelphia, Chestnut Hill. One back man who has been with the streets department since 1997 explained how this new half a million dollar computer-enabled paver is much superior to the 1996 model he originally worked with. 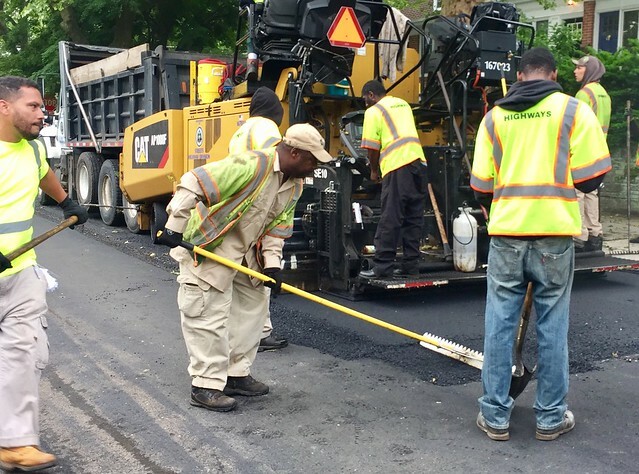 He can monitor the job on a 7 inch display as the paver lays down what appears to be a couple inch thick layer of hot steaming asphalt and smoothly seam in a new section to an existing one, in automatic or manual mode turning the levels. It's important to regulate the speed, depth of material and and create a proper crown proper sloping down to the curb edge for rainwater to drain off. And a good back man, he says, makes less work for the foot crew who finish off the leveling work. At times we are unfortunate enough to be at home when he comes. The blower creates a roar from which he is protected by large ear muffs- but not us. On his last visit, I left the house and he was blasting away plant and soil specks more than an hour later when I returned. 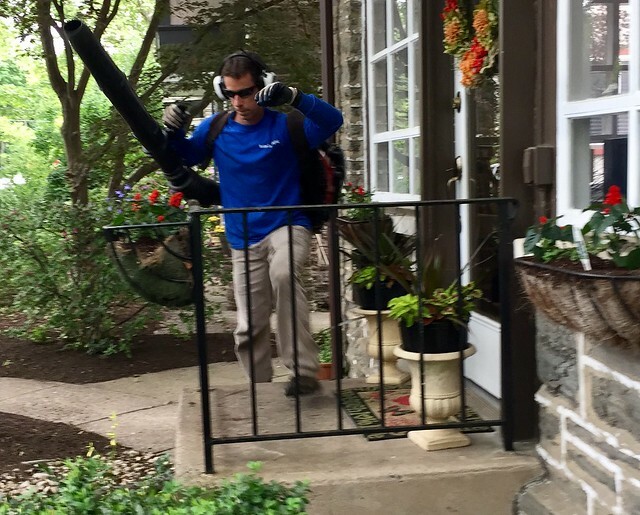 In addition to being gratingly loud, the blower stirs up a large amount of particulate dust which may contain mold, bird feces and what not, a definite health hazard, which is why some communities have banned them. See New York Times article. I wrote about the issue for WHYY Newsworks back in 2010; click here. We appreciate that our neighbors want to keep their garden areas looking attractive. 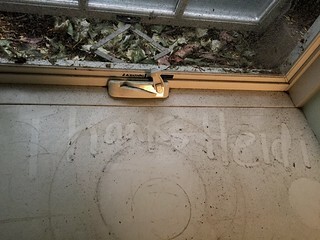 One a lawyer, the other a doctor, keep their windows closed with the heat or air conditioning usually running so are not personally disturbed by the noise, leaf and dust storms created by their landscaper. The lawyer, who complains about breathing problems and asthma is not going to start doing her own modest yard work any time soon. The doctor appears not to have the time or inclination to do her own likewise modest yard work. 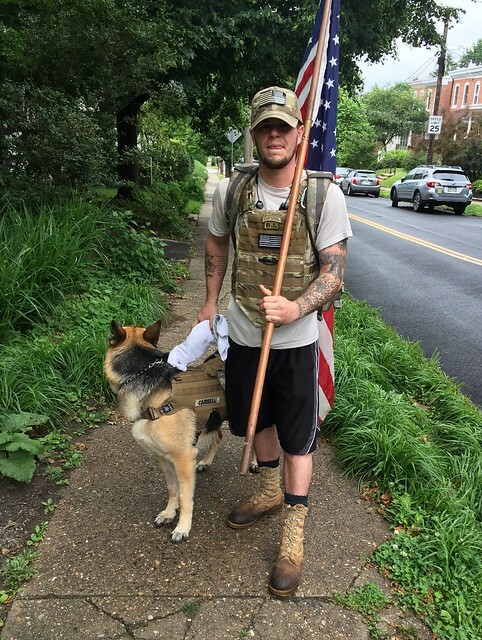 Sadly, their indifference to our distress prompted me to call our City Councilwoman's office. I described the noise and pollution problem to an aide and asked, "Is there anything I can do?" She answered "Not as long as they are doing their job." I then asked "Is there a noise ordinance" and she answered, "No." I believe the aide is wrong on both counts. 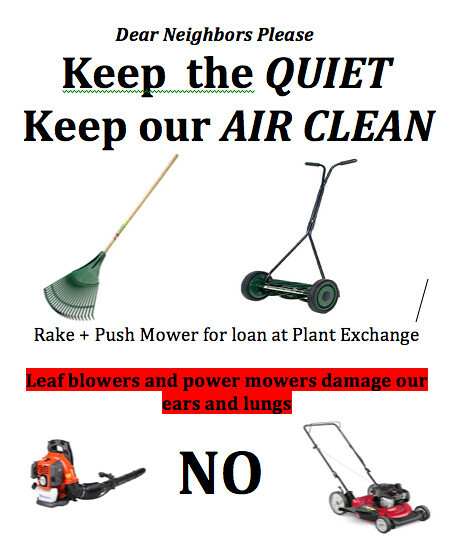 I've begun a little campaign by posting signs to encourage our neighbors on the block to refrain from garden power equipment use on their small yards and, instead borrow our rakes and push mower! Clockwise from top left. Teens from Wordsworth Academy, a special needs school assist children in making recycled bottle planters. An activist with Sea Shepherd talks about the group's efforts to save endangered porpoises and whales. From the Adventure Aquarium in Camden, NJ, a horseshoe crab. FEMA is ready to assist in disasters, this representative from the flood mitigation unit assures. Evergreen Lane farm sets up aquaponics systems. Photo on web here.